This company believes in the power of natural nutrition to enhance and extend the lives of pets. They do not make compromises when it comes to their ingredients or the quality of their products, and each product comes with the Wellness Promise. The Wellness company is a pioneer in holistic pet nutrition and they proudly offer their customers what they call the “Wellness Difference” which promises wholesome ingredients without the use of artificial colors, flavors, or preservatives. Wellness’ pet food products are loaded with fruit and veggie antioxidants, a blend of omega-3 and omega-6 fatty acids, essential vitamins and minerals, plus live probiotics. Simply put, you can count on Wellness to deliver unbeatable quality and natural flavor that your dog will love. Who Makes Wellness Dog Food? The Wellness brand of dog food is made by WellPet, LLC. The company was founded in 1926 as the Old Mother Hubbard dog biscuit company but was sold to Jim Scott, Sr. in 1961. Scott was an animal nutritionist who lead the company to new heights and moved its headquarters from Gloucester to Lowell, Massachusetts. The first Wellness dog food recipes were released in 1997 and cat food recipes were added to the line in 2000. Today, Wellness continues to be an innovator in the holistic pet food industry, known for producing high-quality and healthy recipes for dogs in all life stages. Where Does Wellness Get Their Ingredients? Wellness is technically part of the WellPet family of brands which includes Eagle Pack pet foods and Old Mother Hubbard products. The Wellness company is currently headquartered in Tewksbury, Massachusetts and all of their products are made in the United States. Although Wellness states that their products are U.S.-made, they do not provide specific information about where their products are manufactured. Is Wellness Made in the USA? According to the company website, every ingredient that Wellness uses is “thoughtfully chosen for its nutritional benefits, providing just what pets need for a happier, healthier, longer life”. All of Wellness’ recipes are made with wholesome and natural ingredients including real meats, wholesome grains, fresh fruits and vegetables, omega fatty acids, and live probiotics. Though Wellness does speak to the quality of their ingredients, they do not provide specific information about where they come from. Because the company is based in the United States, however, it is safe to assume that many (if not all) of their ingredients come from the U.S. as well. On March 17, 2019 the Blue Buffalo Company voluntarily issued a recall for one lot of their BLUE Wilderness Rocky Mountain Recipe Red Meat Dinner Wet Food for Adult Dogs. In February 2011, the FDA issued a recall for several canned cat food products due to inadequate levels of thiamine. In May 2012, the FDA issued a recall for 15- and 30-pound bags of Wellness Complete Health Super5Mix Large Breed Puppy food due to potential salmonella contamination. In October 2012, the Wellness company issued a voluntary recall for Wellness Small Breed Adult Health dry food due to possible moisture contamination. Wellness dog food products are available in most major pet food chains as well as local pet food chains and specialty pet food stores – you can also purchase them from online pet food retailers. Wellness generally doesn’t offer coupons on the company website but you can sign up for the company newsletter using your email address to receive tips and special offers. You may also be able to find Wellness dog food coupons from individual retailers. Is Wellness Dog Food Expensive? The Wellness brand of dog food offers a wide variety of different products, all of which are made with premium-quality ingredients. 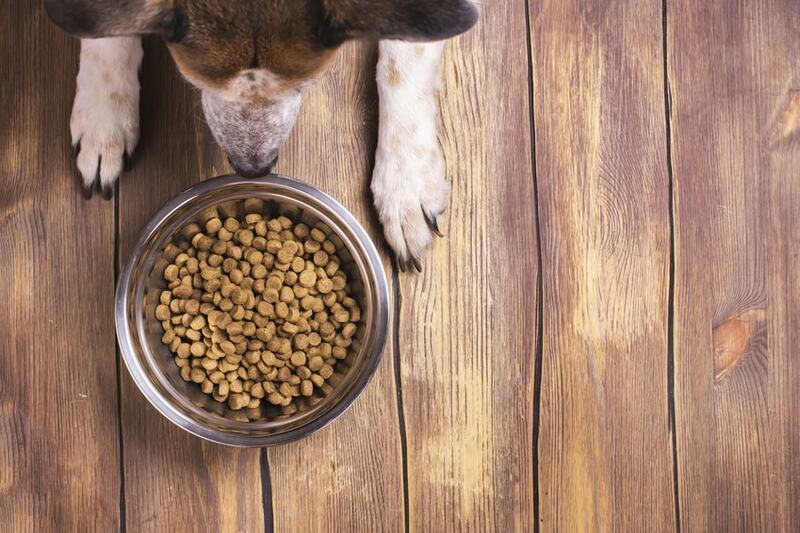 The price of Wellness dog food varies from one product line to another, but most of them cost more than the average kibble because they offer much higher quality. A 26-pound bag of Wellness CORE grain-free dry dog food will cost you between $53 and $93 while a 30-pound bag of Complete Health dry food costs $47 to $80. Wellness TruFood Baked Blends costs about $60 for an 18-pound bag and Simple limited ingredient dry food costs about $50 for a 26-pound bag. Wellness wet food comes in a variety of forms including 5-ounce and 6-ounce trays as well as 6-ounce, 12.5-ounce, and 13.2-ounce cans. Wellness wet foods range from $25 to $65 per case. What Kind of Dog Food Does Wellness Offer? The Wellness company offers a wide variety of dry and wet dog food products as well as an assortment of snacks and treats. When it comes to their products, Wellness has four main product lines – Complete Health, CORE, Simple, and Trufood. The Complete Health line of products features both dry food and wet food products designed for dogs in all life stages and of all breed sizes. There are both original and grain-free recipes in this product line including healthy weight formulas. The CORE line of products is entirely grain-free with formulas designed around the idea that dogs thrive best on a diet that is comprised primarily of meat. The Simple line of products features limited ingredient diets for dogs that suffer from food allergies and sensitivities. The Trufood line of products features oven-baked blends of quality protein and digestible carbohydrate. The Wellness pet food company promises their customers that they only use high-quality ingredients in each of their recipes. They also promise not to use low-quality ingredients like corn, wheat, and soy products as well as non-nutritive fillers and byproducts. All it takes is a quick review of the ingredients lists for several Wellness products to reveal that these claims are true. Each Wellness dog food recipe starts off with a high-quality protein and is supplemented by a wholesome carbohydrate. Most of Wellness’s recipes are also supplemented with plenty of omega fatty acids, fruit and vegetable antioxidants, and live probiotics for digestive support. This Wellness Complete Health Grain-Free Adult Lamb & Lamb Meal Recipe is an excellent source of complete and balanced nutrition for adult dogs. It features protein-rich lamb as the main ingredient with potatoes and peas for grain-free carbohydrate energy. This recipe is loaded with super nutrients as well, including spinach, flaxseed, blueberries, and more. Because this formula is grain-free and made with a protein that is novel for many dogs, it may be a good choice for dogs that suffer from food allergies and sensitivities. All in all, it is a great example of the kind of quality Wellness makes an effort to deliver with each of their products. As you already know, the first ingredient in this recipe is lamb. What you need to remember about fresh meats like lamb is that they contain as much as 80% moisture by volume. When the final product is cooked, most of that moisture will be lost and the final volume of protein provided by the lamb could end up being much lower. Because lamb meal is the second ingredient, however, that won’t be a problem for this Wellness Complete Health Grain-Free Adult Lamb & Lamb Meal Recipe. Lamb meal is simply fresh lamb that has been cooked to remove moisture – this means that it contains up to 300% more protein by volume than fresh lamb. This recipe also contains other supplementary proteins like menhaden fish meal and some plant protein from the peas, chickpeas, and flaxseed. The main sources of carbohydrate energy in this recipe are potatoes, peas, and dried ground potatoes. All of these are gluten- and grain-free carbohydrates which makes them highly digestible for most dogs. There are also several supplementary sources of carbohydrate like chickpeas and flaxseed as well as supplementary fiber sources like tomato pomace. You will also find that there are a number of fresh fruits and vegetables included in this Wellness Complete Health Grain-Free Adult Lamb & Lamb Meal Recipe. These ingredients provide some carbohydrate energy and dietary fiber, but they are most valuable as natural sources for key nutrients. The remaining ingredients in this recipe consist primarily of fats, natural flavors, extracts, synthetic supplements, and dried fermentation products. The main source of fat in this recipe is chicken fat which is a highly nutritious source of concentrated energy for dogs. This ingredient is supplemented by ground flaxseed which helps to ensure a balance of omega-3 and omega-6 fatty acids for your dog’s healthy skin and coat. In terms of supplements, there are a number of synthetic vitamins and several chelated minerals. Chelated minerals are minerals that have been chemically bound to protein molecules – this increases their absorption and improves their uptake for your dog. The dried fermentation products listed act as probiotics to support your dog’s healthy digestion. This Wellness Complete Health Grain-Free Adult Lamb & Lamb Meal Recipe is formulated to meet the nutritional levels established by the AAFCO Dog Food Nutrient Profiles for maintenance. Overall, this Wellness Complete Health Grain-Free Adult Lamb & Lamb Meal Recipe is a high-quality recipe made with fresh and wholesome ingredients. This recipe starts of strong with both fresh lamb and lamb meal at the top of the list and stays strong with the inclusion of several gluten-free and grain-free carbohydrates. This formula is rich in animal-based fats which provide a blend of omega-3 and omega-6 fatty acids for healthy skin and coat, plus dried fermentation products for probiotic support. This recipe is a little high in crude fiber and could stand to be a little higher in protein and fat but, all in all, it is a quality product. This Wellness CORE Hearty Cuts Grain-Free Chicken & Turkey Recipe is a protein-packed formula made with real chicken and turkey. This recipe is completely grain-free and made without any corn, wheat, or soy ingredients, not to mention artificial additives. Feel free to use this recipe as your dog’s staple diet if he does best on a wet food product, or use it as a meal topper or mixer to add flavor and moisture to your dog’s dry food. This recipe is loaded with meat and flavor, plus it is simmered in a delicious gravy and supplemented with nutrient-rich superfoods. The main ingredient in this recipe is fresh chicken. While fresh meats contain 80% moisture by volume, that isn’t a problem for this recipe because even after cooking, the moisture content remains high at 82%. That means that the original volume for the fresh chicken won’t change much during processing. The second and third ingredients – chicken broth and turkey broth – help to preserve the moisture content of this recipe while also contributing natural flavor. Additional sources of protein included in this recipe are turkey, chicken liver, and dried egg whites. The primary source of carbohydrate in this Wellness CORE Hearty Cuts Grain-Free Chicken & Turkey Recipe is potato starch and it is supplemented by sweet potatoes and green beans. This recipe includes several sources of supplementary fiber such as ground flaxseed and guar gum which also acts as a thickener. The main source of fat in this recipe is canola oil which works with the natural fat content in the chicken and turkey to provide a balance of omega fatty acids. As a plant-based fat, however, canola oil is less biologically valuable than an animal fat. The remaining ingredients consist primarily of fresh fruits and vegetables which act as natural sources for key nutrients and synthetic supplements, including chelated minerals. This Wellness CORE Hearty Cuts Grain-Free Chicken & Turkey Recipe is formulated to meet the nutritional levels established by the AAFCO Dog Food Nutrient Profiles for growth and maintenance except growth of large size dogs (70 pounds or more as an adult). Overall, this Wellness CORE Hearty Cuts Grain-Free Chicken & Turkey Recipe is an excellent source of quality nutrition and natural flavor that your dog is sure to love. This formula is packed with premium proteins and digestible carbohydrates, not to mention plenty of healthy nutrients. With fresh fruits and vegetables dominating the ingredient list, this formula gets plenty of vitamins and minerals from natural sources, though synthetic supplements are still needed for balance. This recipe could benefit from the addition of an animal-based fat but, all in all, it is a great product. bought dogswell vitality dog treats and now my dog is in renal failure. She is old but my daughters dog ate the same thing and she would urinate while in a deep sleep. I have my dog on a bunch of meds from the Vet but am not too hopeful. She is 13. I do not want anything other than them to be aware. I understand china is a contributing factor although this is suppose to be made in the USA. Dogswell vitality dog treats are Not a Wellpet product. I can’t find it listed anywhere on this website. I’m sorry to hear about your dog’s renal failure. Which corporation actually owns Wellness Dog Food? I fed my poodle/mix wellness grain free small breed food for the last 8 months. I has just been diagnosed with acute renal failure. (Sudden Kidney Failure) He was only 3 years old. Treatments were not effective and he had to be put to sleep. We are heartbroken. Has anyone else had any problems with this food?